IBPS exam is not about the toughness it is mainly about the time management..If u can manage the time properly u can solve the whole exam. Now the question arises how to manage the time..?? Firstly go for either the General awareness or computer section..whichever feels can increase your confidence level or which you are having a good hold and try to complete both these section in maximum 30 minutes .. not more than this. If you know the answer then you can do it otherwise not.. there is no need to think much on the questions and side by side mark the circles in the OMR sheet. Dont waste ur time by marking circles on the paper then the OMR sheet. 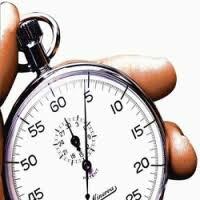 For english section and do it in maximum 30 minutesand if you are weak in english then take 35 minutes maximum. Dont waste too much time in this..as it is not the scoring section. First solve 10 questions and Collectively mark the answers in the OMR sheet..This will definitely save your time in attempting both the sections..